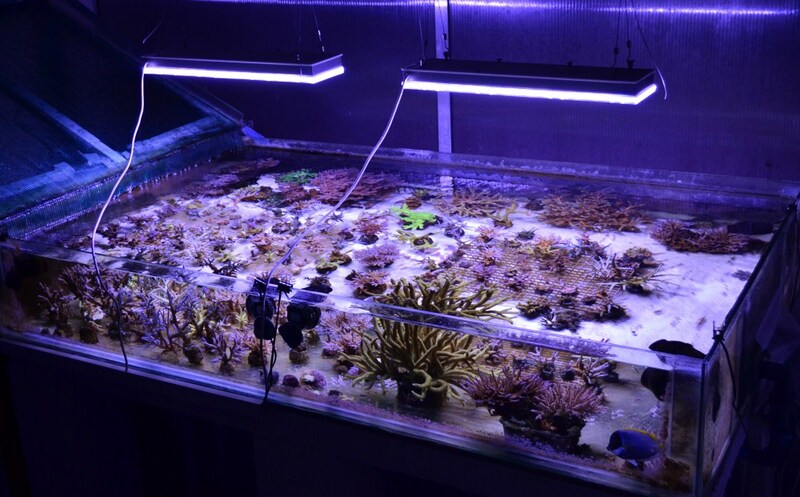 In 2009, Orphek designed and built the first LED fixture capable of growing all types of corals without regard to coral placement due to insufficient PAR levels at depths where other LED companies failed to succeed. 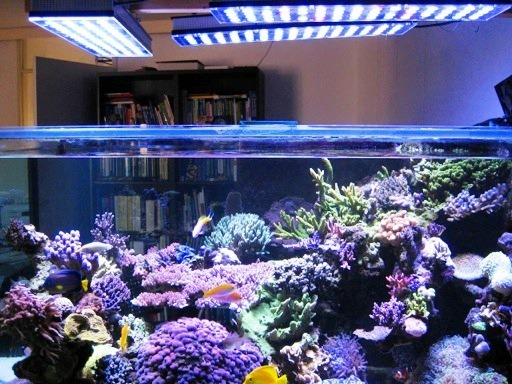 The revolutionary PR156 allowed aquarists to freely aquascape their aquariums by placing corals where they looked best. 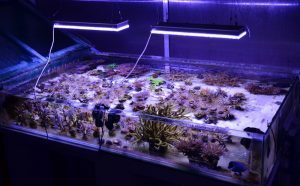 There was no need to place light loving corals near the surface and graduating downward with corals requiring less light. The PR156 provided the necessary PAR/PUR at the deeper zones of the aquarium to support all photosynthetic life forms. 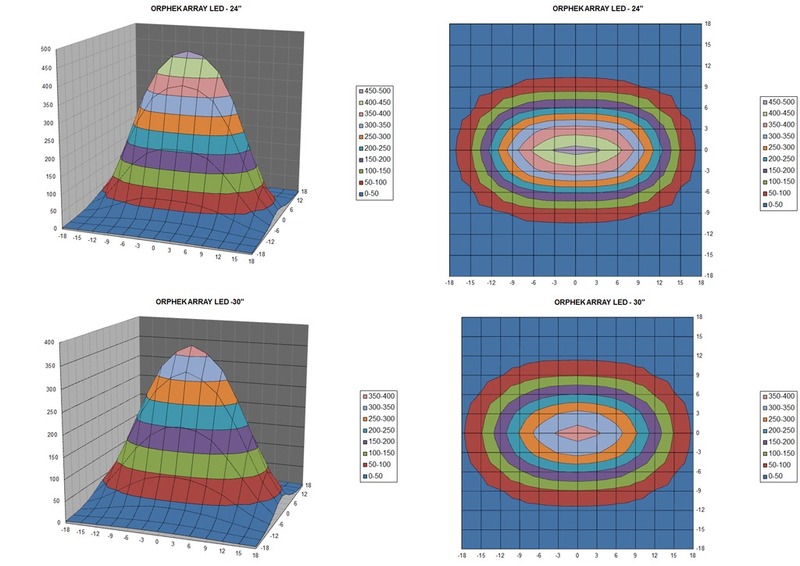 Orphek’s design goal was to provide good penetration by using lenses which would achieve high PAR/PUR values at depths over 36 inches. The lens was designed to narrow the beam which allowed better light penetration for tanks 36 inches and deeper. 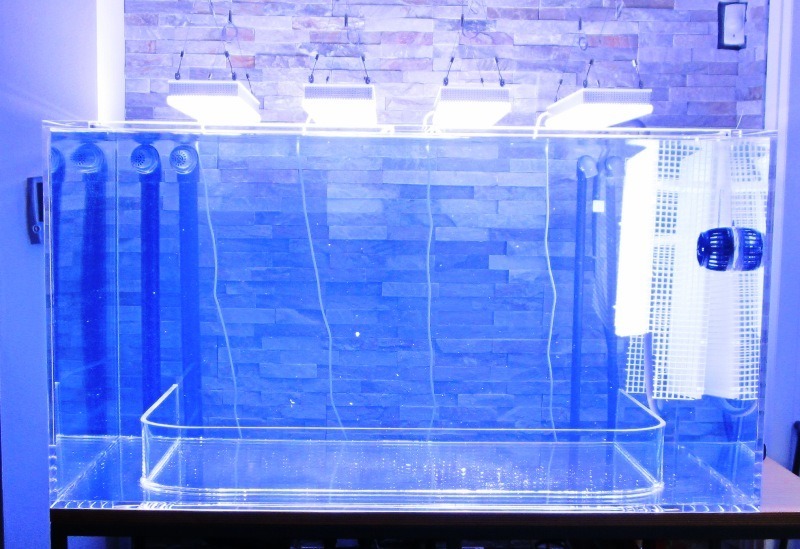 The idea behind this design was that multiple fixtures could then be used to cover longer lengths of aquariums while still providing high PAR/PUR levels to the deeper zones of the aquarium. Until the PR156 was developed, no other LED fixture manufacturer was able to do this. 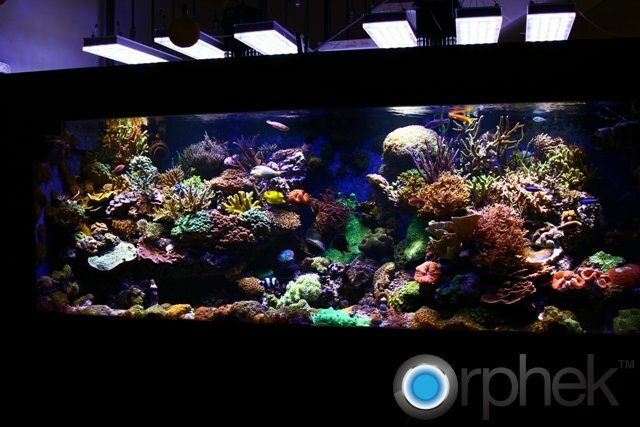 Here are some examples of deep tanks illuminated by the Orphek PR156. Also here is PAR map provided By Sanjay Joshi, Ph.D. The Orphek PR156 uses three watt LEDs but runs them at two watts to reduce heat and provide better longevity for the LEDs. Heat is a common enemy of all electronics and this method has proven itself as over 60,000 LEDs have been used in PR156 pendants with a very low percentage of failure due to heat…less than one percent. The PR156 was equipped with a two channel timer which allowed a sunrise to sunset effect by controlling the blue LEDs with one channel and the white LEDs with the second channel. There was no good reason to develop and use a dimming feature which would thereby increase the cost of the unit while providing no real benefit. Orphek uses proprietary 16K white LEDs to increase the PUR value and reduce the amount of blue LEDs which have a very low Lumens per watt ratio. In this regard the PR156 provided the highest Lumens per watt on the market and arguably the best performer. The PR156 can also be custom ordered in any configuration of blue and white LEDs the customer may want. Another design goal of the PR156 was to provide a slim unit with a separate power supply and timers incorporated into one control box. This allowed the electronics to be safely placed away from the harsh salt water environment. The first generation PR156 came equipped with 90 degree lenses which still remain the standard today. The PR156W incorporates a 120 degree lens which gives a wider spread of light which is more suitable for wider and shallower tanks. For larger tanks, the length, width, and height of the pendant will determine the number of units needed to provide effective PAR levels. 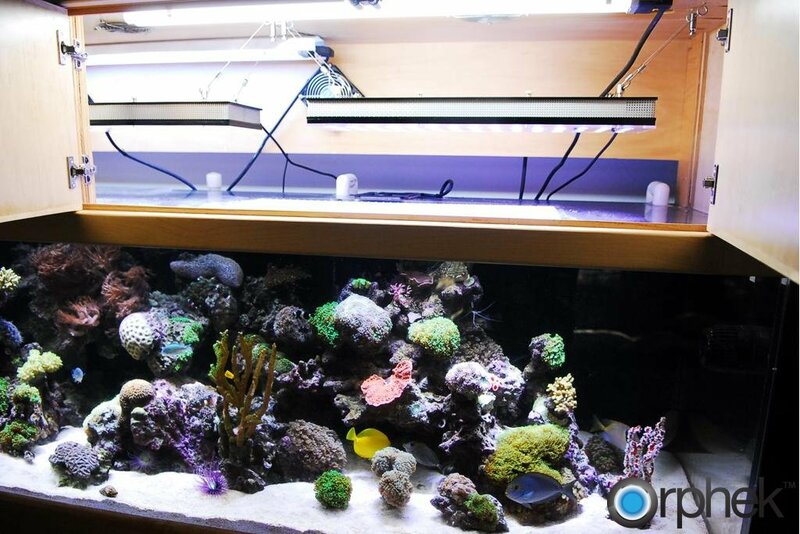 For SPS coral growth in deeper aquariums, the PR156 is the recommended fixture. In 2010 a honeycomb lens was developed that did not change the light spread much but reduced the focus effect. This wider lens is also recommended for deeper tanks. In 2010, Orphek added four UV LEDs to the PR156. The UV LEDs are high range and posed no danger to human eyesight. This development increased coral florescence and covered the chlorophyll A range. At the end of 2012 Orphek launched the PR156 PLUS series which incorporated a better power supply and higher Lumens per watt LEDS. The Meanwell Power Supply offered better cooling and lower noise while still providing two channels of control. In addition to the UV LEDs, two red LEDs were added which increased the spectrum to include chlorophyll B in addition to the already present chlorophyll A which was added with the PR156UV series. This new development along with the new Mean Well driver increases the PAR and the PUR wavelength which provides even better coral growth and appearance. The color pop in red pigmented corals is stunning. The PR156 PLUS XP is the culmination of two years of research beginning with the original PR156. Our latest model is also available as the PR156 PLUS XP Profilux GHL and PR156 PLUS XP Neptune Apex. These units are fitted with the proper connectors which will allow the LEDs to be controlled by either of the above controller’s external hardware. In the case of the Neptune Apex, connectors will be installed to connect to the Neptune Variable Speed Dimming Module. For the GHL Profilux controller, the PR156 will be set up to use with the GHL LED Control 4-Passive Module. They will be configured for two channel operation. One channel will control the blue LEDs and the other channel will control the white LEDs. Orphek can also provide the GHL EVG interface expansion module if needed.